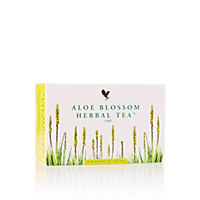 Aloe Blossom Herbal Tea is a natural blend of leaves, herbs and spices, specially prepared to provide an outstanding flavor and a rich aroma. Caffeine-free, it has been formulated to leave you feeling revitalized. Whether you drink it hot or prefer it iced, Aloe Blossom Herbal Tea has a great taste and is easy to prepare. This international product combines carefully chosen ingredients from China, Jamaica, Egypt, America and India. Refreshing cinnamon, orange peel and cloves impart a warm, fruity flavor, along with allspice and ginger to soothe. Combined with aloe blossoms from our own plantations, this low calorie, refreshing tea is a great complement to our Forever Lite weight management program.